I work on a “no watering” principle so it was interesting this past summer to see how it coped. We had temperatures up to 32C and no rain for nine weeks. 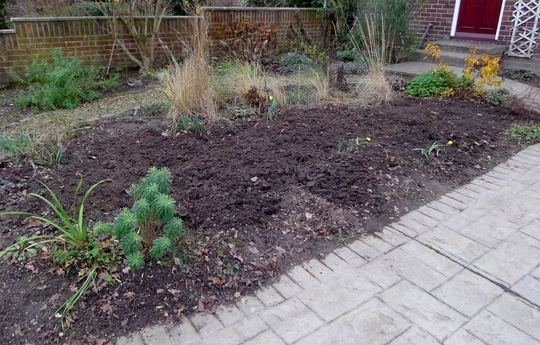 Most of it coped well, but the big tree peony died – despite copious watering it just couldn’t cope. So that left a big hole in the middle of the area. 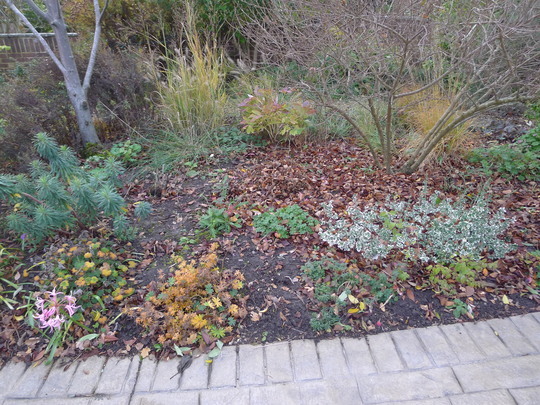 The tree on the left is an amelanchier. It has white flowers in spring, berries in August, and autumn colour – a good all-rounder. Except the flowers only last a week if the weather is hot and sunny, pigeons strip the berries within 48 hours, even before they have ripened, and you can never rely on autumn colour. The shrub on the right is callicarpa dichotoma. It too has good autumn colour – bright PINK leaves every year, regardless of the weather. But for the rest of the year, it just sits there and doesn’t contribute much. 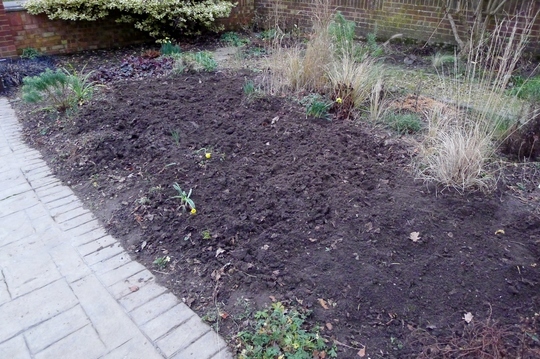 I decided the demise of the tree peony was a good excuse to replant the whole bed. Not only did these plants require no water, they positively basked in the conditions. With climate change making conditions like this summer more and more likely, this seemed the right approach to take. Now it’s a case of breaking open the piggy bank, ordering plants (lots), and get them in the ground when the soil warms up. We’ll see how it goes, and I’ll write a few more blogs so you can see if it’s working. I can't wait to see how it goes. Nothing like a blank canvas to get the plant catalogues arriving. wow that is a definite revamp isn't it. Westshores nursery in Lincolnshire [possibly at Winterton cant remember exactly but close to the Humber rather than Lincoln] is a specialist grass nursery and John and Gail Summerfield are very helpful and reasonably priced. will look forward to how this progresses. I like this and have put it on several categories as i think it is of interest to many. 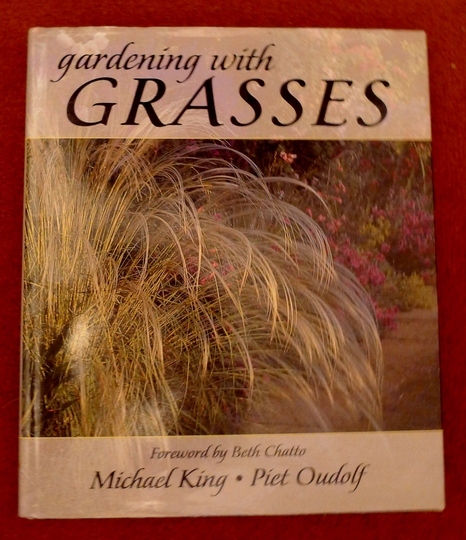 Neil Lucas is my go to man for grasses, I have his book Designing with grasses 2011, found it very useful, has a decent website too!! 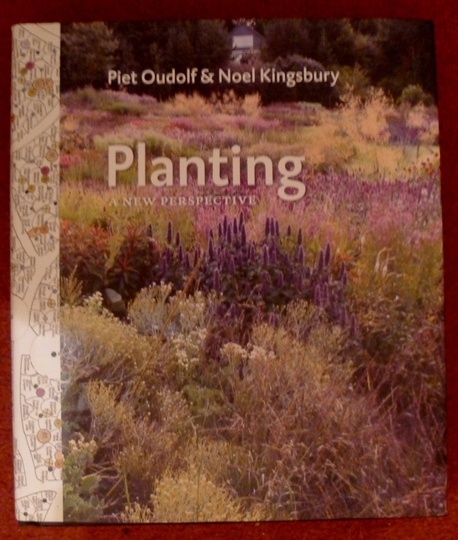 Oudolf re planned the Scampston Hall garden in Yorkshire. it is a stunning garden. if you are in the Malton area then it is well worth a visit but it isn't open all the time so you'd need to check their website. I shall look forward to seeing your updates such a shame you lost that gorgeous tree peony though. Thank you for the link very soft effective and colourful planting in it. That's a very bold move - I would never have had the courage to be so radical - really looking forward to seeing the transformation! DD - Neil Lucas, is that Knoll Gardens? Daylily - have you posted any pictures of your hot border? That is very interesting, Andrew. We have peonies in Sweden and it was very hot there all summer. I was hoping they might have survived because no-one watered them. The only thing is, the water table is very high so if their roots get down far enough they will be ok. It was a beautiful Peony you lost. 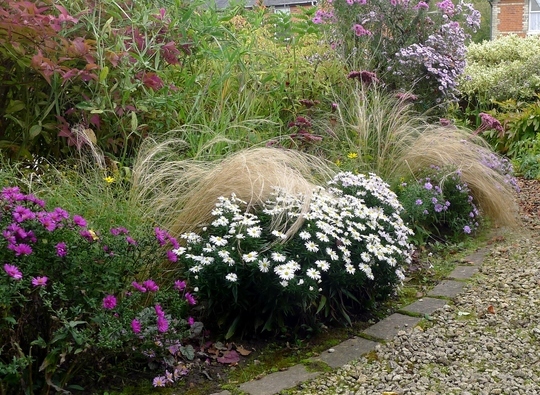 I wonder how the grasses would cope with extreme cold in the winter. I also fine plants very difficult to getting Sweden, but maybe seeds would do. Andrew Neil Lucas is Knoll gardens, have you been, not too far from you, as the crow flies! DD - I've added it to my list to visit this year. Went to Wiley yesterday. They have a new Winter Walk that looks stunning but you'd need seven acres to duplicate it! Thanks for that, it's really given me food for thought. The idea that with paved areas to walk & put chairs, I can gradually do away with the lawn type grass & plant more flowers, etc. & it looks that good is perfect for me!